I have been lazy so ever since r3608 I have not svn upped this site because plugins that I need weren’t ready and I didn’t bother modify plugins myself, so I have been waiting. I bought my DIY PC home which I have been using in the office, reinstalled everything with only a Windows 7 and ubuntu 9.04 partitions. I’ll be using the ubuntu partition as my coding environment. While doing that my howto for LAMP installation has been proved good for 9.04 as well. @9:25pm now theme fixing has been done and thanks Karen’s friend again helping me with the very nice English title font (Chinese font to her credit as well) which is also now incorporated. My server just suffered a crash due to a very high CPU load. Upon a hard and a soft boot it went back to normal again. Found out from ‘top’ that php-cgi was consuming exceptionally high loads when the home page of my custom theme was loaded. 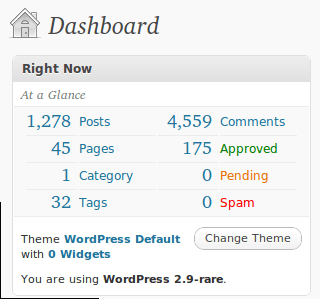 All other WordPress sites that I’m hosting have not suffered from this problem. This could be a theme specific problem so the safe bet for now is using the default theme. The header is in a mess I know and I’ll fix that later when I have time.